: The National Air and Space Museum is already the most popular museum in the world; one year from now it will also be the largest. The museum reports that its annex, the Steven F. Udvar- Hazy Center is on schedule to open in December 2003 to coincide with the centennial of flight. Eighty percent more of the national aerospace collection will now be on exhibit including the approach and landing test orbiter Enterprise. : Sci-fi movie director, deep sea diver and space tourist candidate James Cameron is focusing efforts to reignite "the interest in continuing the journey" of space exploration, reports The Hollywood Reporter. To that end, this weekend Cameron and some of his friends will salute the 30th anniversary of Apollo 17 by screening a special edition of For All Mankind, followed by its wide release as a streaming video online. 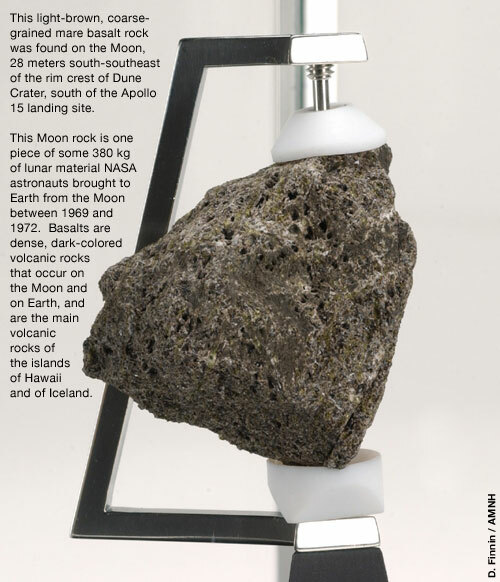 : The American Museum of Natural History's Rose Center for Earth and Space in New York may already offer the latest research on the formation of the solar system but as of Thursday, it will feature a piece of it: a moon rock brought back to Earth by Apollo 15 astronauts Dave Scott and Jim Irwin. The sample, on loan from NASA, joins three already on display at the museum. Also in New York, astronauts in space and on Earth will help light the Christmas tree at Rockefeller Center tonight. The ceremony will be shown on NBC starting at 8:00 p.m. ET. Beyond where the "sky meets the dawn"
: For his first entry in the ship's log, International Space Station (ISS) commander William Shepherd wrote a poem describing the orbiting outpost sailing "beyond realm of sea voyage or flight," with electronic pulses instead of a compass, solar panels set as sails, leaving a wispy, invisible wake as they went "beyond lines where sky meets the dawn." Now on Earth and retired from NASA, Shepherd has time to reflect on his journey and the station's future. Francis French spoke with Shepherd while the former astronaut toured with the IMAX movie that captured his experience. : What do you get if you combine Eric Jones' Lunar Surface Journal, Michael Light's Full Moon, and Tom Hanks' passion for the Apollo voyages? Magnificent Desolation, a new 3D IMAX movie in development by Hanks' production company Playtone. According to an IMAX release, the film will use the works of Jones and Light together with computer images, voice- over actors as well as rarely seen NASA archive footage. : The Kansas Cosmosphere and Space Center will open a display Saturday commemorating the 30th anniversary of Apollo 17, reports the Associated Press. The centerpiece, an Alan Bean painting of Gene Cernan repairing the lunar rover will be joined on exhibit by the actual damaged fender and the map book from which its replacement was fashioned. The art, "Tender Loving Care," is on loan through January 10 from former NASA Teacher In Space candidate Barry Schartz, who commissioned Apollo 12 moonwalker Bean to create it. : Before the International Space Station, before we went to the Moon, even before the first liquid rocket left the ground, there was David Lasser. In 1931, he wrote The Conquest of Space, the first English book to address the notion of spaceflight as a real possibility. Larry McGlynn reviewed Conquest, recently re-released by Apogee Books. : New York auction house Swann Galleries has scheduled its first space memorabilia sale for April 12, 2003. The auction will offer an array of lots, ranging from astronaut artifacts to unsigned photographs. (say that five times fast): Apogee Books' editor Robert Godwin has provided collectSPACE readers with two treats. He has shared photographs from last Friday's Apollo 17 anniversary dinner held by philantropist Robert Lorsch. As can be seen by the photos, the astronauts in attendance graciously signed a table-full of memorabilia for charity. For those unable to attend, Godwin has also provided a very limited number of autographed Apollo 17 Mission Reports that we are now selling to raise funds for the Astronaut Scholarship Foundation. 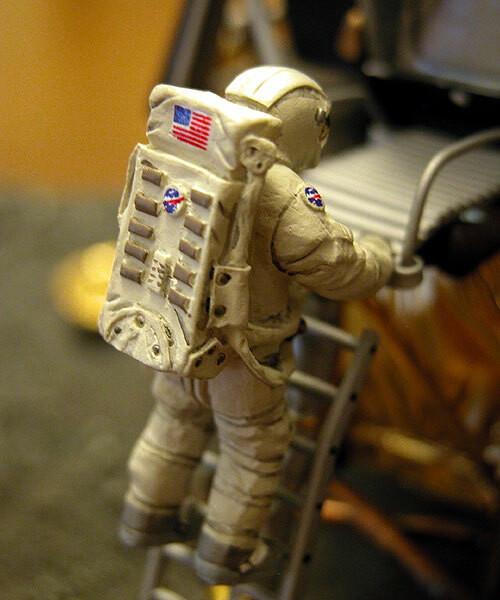 : Code 3 Collectibles has delivered on their promise, with a new moonwalker (sans commander's red stripes) for their Lunar Module model, part of the National Air and Space Museum Collection. Scott Schellhase, Code 3's Executive Vice President said that all who ordered the model will get the replacement LMP. : Novaspace Galleries has begun to tell its clients that its popular Astro-Auction will return in January. The space-only marketplace closed in October after problems were experienced with its server software. The relaunched Astro Auction is expected to be quicker and restructured to cater to qualified sellers. Novaspace also announced that James Lovell will conduct a private signing for them in late February. : When we last left the Astronaut Hall of Fame it had been sold to Deleware North Park Services, the same company responsible for the operation of the Kennedy Space Center Visitor's Complex. Three months and a $700,000 renovation later, the Hall will reopen to the public tomorrow without much fanfare (a formal grand opening will be held in the spring). : Today is "Wright Brothers Day" per a proclamation signed by President G.W. Bush, marking the first "successfully sustained and controlled flight with a heavier-than-air, engine-powered aircraft." To kick-off a yearlong celebration of the centennial of flight, the National Air and Space Museum held a gathering of aviation pioneers this morning, including John Glenn and Neil Armstrong, as well as actor and pilot John Travolta. : The updated and revised memoirs of Apollo 7 pilot Walter Cunningham, The All American Boys will be released by Ibooks Inc. in April 2003. According to Cunnigham's website (produced by cS guest author Tracy Kornfeld), the new version will incorporate the astronaut's views on the deterioration of the Russian space program as well as the George Abbey era at Johnson Space Center. : The updated schedule for Scott Carpenter's tour promoting the release of For Spacious Skies: The Uncommon Journey of a Mercury Astronaut adds new locations and the time for most events. Also confirmed is the date of our own booksigning, so if you are unable to meet Carpenter in-person, you can buy a signed book by co-authors, Carpenter and Kris Stoever. : From Karl Tate, author of our Buck review, comes news that Connecticut Valley Insignia has begun production on a patch and instruction label set for Dragon Models' Apollo astronaut figures. With CVI's fabric decals, collectors can now improve on Buck's or Buzz Aldrin's markings or outfit the figures to represent the suits for other Apollo 11-14 astronauts. The CVI set will be available from The Toy Cellar in January. : Remember the three NASA co-ops who last July thought it would be fun to steal a 600 pound safe from NASA's Johnson Space Center and then attempt to sell its contents, Apollo moon rocks and Martian meteorites, to undercover FBI agents posing as rock collectors from Belgium? Per NASA, the trio plead guilty and are waiting to learn their sentence. A fourth defendant is still expected to stand trial in January. : By the nature of their settings, many of the best photographs taken by the astronauts are filled with a lot of white, or more appropriately, black space. For autograph collectors, this is both a blessing and a curse: plenty of open room for a signature but it is only visible if signed with a paint pen that is succeptible to blotching and smears. Sharpie may have the answer with the offer of a silver marker that can control ink flow. : China launched its fourth Shenzhou today, leading speculation that a manned flight could follow in 2003. After its first flight in 1999, Shenzhou I flown coins and stamps were offered for sale. There's no word yet if today's Chinese launch carried aloft souvenirs. : As part of an ongoing discussion about recovered rocket boosters, a fountain pen was mentioned that was produced in part from metal taken from John Glenn's 1962 Mercury mission. Lih-Tah Wong's website has full story behind these rare utensils. Not only did Parker produce Friendship 7 pens, but four years later issued five very rare fountains with Apollo 15 moondust returned from Hadley Rille encased in the pen.